The monks of Mepkin rise in darkness. A few may have quietly awakened earlier in order to sink themselves into the still and fertile silence, where prayer is born. At 4:20 AM, the community gathers in the Abbey Church for the hour of Vigils. As the tower bell sounds to proclaim to the slumbering world the beginning of the monastic night-watch, the monks stand in anticipation of the coming of Christ in time and in their hearts. Like deep-sea divers the brothers immerse themselves in the chanting of the Psalms. Over a two-week period they will weep, wash in, drink from, frolic in these one hundred and fifty wonderful songs of Israel’s King David. The entire spectrum of human emotion and experience will be encountered in this recurrent biweekly pattern. 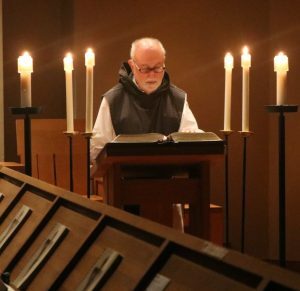 At the conclusion of Vigils, replete with the images of the Psalms, the monks spend a half hour in meditation. The ground of the heart is plowed and the seed of the Word is sown. Now the seed continues to germinate in the silent stillness of meditation. Their hearts thus prepared after the half hour of meditation, the monks spend the next hour or so in lectio divina (sacred reading). The monk ponders attentively God’s Word in the Sacred Scriptures. He approaches the Word not as one trying to extract information, but as one who stands ready to be challenged and formed by the Word. His heart enters into a dialogue with the heart of God. The fruit of this encounter with grace is an awakening to the contemplative dimension of everyday living. Emerging from the silence of these hours of contemplative reflection, the community again makes its way to the monastery’s heart, the Abbey Church. As the creatures of the surrounding wood and water rise from their rest, the monks stand poised on the pointe vierge (the virginal point of the day) waiting to be called to praise. This is the hour of Lauds, when the monks greet the dawn breaking upon the world of darkness. From ancient times, Christians have experienced in the rising sun a symbol of the Risen Christ, who conquers the darkness of sin and death. The mood is one of praise for Christ’s victory over the shadow of death, and anticipation of this day’s encounters with Christ. At the conclusion of the hour of Lauds, breakfast is available. The monk then has an interval during which he may tend to personal chores, read, or pray. The rhythm of prayer is taken up again. At 7:30 AM, the community assembles for the celebration of the Liturgy of the Eucharist: the Mass. In the breaking of the Word and the Bread, the monastic church renders present the dying and rising of Jesus. As the monks join the offering of the whole of their life to Christ, they participate in the source and summit of Christian life. The bread and wine of the Eucharist, the sacrament of the Body and Blood of Christ, is spiritual food for the journey. Following a short period of thanksgiving after Mass, the community reassembles to pray the hour of Terce. Like Sext and None, Terce is designated a “Little Hour” because of its brevity in comparison to Lauds and Vespers. As the Brothers prepare to begin the work of the day, they call upon the Holy Spirit. They ask that the same flood of holiness that filled those in the Upper Room, might inspire all that they think or do or say. Work takes up the remainder of the morning. After Terce, the monks assemble in the Chapter Room, the community meeting room adjacent to the Church, where daily work is assigned. Most will be occupied on the mushroom farm in some manner. Food is being prepared and cooked for the twenty-one monks and the guests on retreat. As St. Benedict writes: “When they live by the labor of their hands, then they are truly monks” (Rule 48:8). Hard physical labor also provides balance of mind, body, and spirit, central to the life of prayer. Further, labor strengthens the bonds of fraternal communion by sharing in a common task. Work ends at 11:30. At the end of the morning work period, the monks return to the monastery, clean up, and prepare themselves for the Little Hour of Sext, or Midday prayer. Its position at the middle of the day provides a pause to rest and reflect on what has happened thus far. The light of the Sun of Justice discloses our thoughts and actions. We ask for strength and assistance for what lies ahead. From the Abbey Church the community slowly proceeds to the refectory, the monastic dining room, for the midday meal, the one common meal of the day. According to the monastic tradition expressed in the Rule, the refectory is seen as parallel to the Church, where the Eucharist is celebrated. The common meal has a sacramental character. The Rule insists that all the monks be present at the common table, and reprimands those who are late or careless concerning it. All meals are taken in silence, and prayer begins and concludes this gathering. A book is read aloud by one of the monks for the benefit of all. At the conclusion of the meal, once the tables are cleared, the community prays the Little Hour of None in the refectory. Nourished and refreshed, the monks offer once again the work of their hands, the thoughts of their hearts, and the words of their mouths to God. The searing light of noon mellows and dapples the canvas of the monastery grounds as the day runs its course. The evening light casts a golden glow which illumines the landscape as if from within. The sun hangs motionless on the horizon, unwilling to give way to the impending darkness. After a light supper, the monks may take a walk among the fleeting silent shafts. In the fading light of day, the monks relinquish the day’s busyness in order to enter into the descending silence. At Vespers, all that has been given is now brought before God. We ask forgiveness and healing for what we have done and what we have failed to do. A spirit of thanksgiving infuses the monks’ chant for all the good that has been accomplished. “My soul glorifies the Lord; my spirit rejoices in God, my savior.” In chanting the words of Mary’s Magnificat, the monks’ prayer joins the rhythm of the prayer of the Church throughout the world. After Vespers, the remainder of the day may be given to personal prayer or light reading. Several days a week a community meeting is scheduled for 7:00 PM. At this time the monks may discuss a current monastery project, share information, or listen to the teaching of the abbot. Finally, weary from the day’s work and longing for the balm of sleep, the bell for Compline calls the community to gather for the closing prayer of the day. 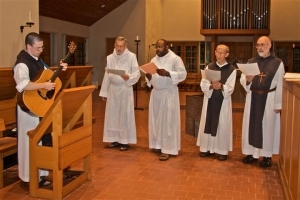 Chanting the same two Psalms each evening allows these words to arise out of the heart of the monk, out of the very being of the monastic community. There is no need for light to read these words. They are written on the heart. There is an inner light of Christ encountered in the rhythms of prayer, work, and communal living. In this light the monk sings in wonder: “You have put into my heart a greater joy, than they have from abundance of corn and new wine” (Psalm 4:8). Through the voice of the psalmist the Lord responds: “With length of life I will content him; I shall let him see my saving power” (Psalm 91:16). The darkness draws near. But darkness is a friend of the monk, a great presence stirring beside him. God is in the darkness. God is the mystery to whom the monk entrusts his being in faith and in hope. It is Mary, woman of faith and Mother of God, who enfolds the monk in loving confidence. In her dark hour of the angel’s visitation, she responded “Fiat,” be it done unto me. To this woman, mother, and disciple of Christ, the monks bid their nightly greeting and farewell, praying that she may lead them to see the blessed fruit of her womb, Jesus. Before this day’s beginning, the monks awakened from night’s deep darkness to chant the Psalms. At day’s end, their last words are for the grace of a quiet night and a peaceful death. Through this never-ending rhythm of daily, weekly, monthly, yearly prayer, the monk is transformed, little by little, and becomes a living praise to God’s grace and mercy. Immersed in this eternal rhythm, the monk echoes the bride: “I sleep but my heart keeps watch” (Song of Songs 5:2). Carried through this day by faith, hope, and love, he now waits for the dawning of the day that will have no end.